The Geriatrics Training Program of the University of Puerto Rico School of Medicine and affiliated hospitals provides a one-year Fellowship devoted to teaching the specialized care of the elderly with acute and chronic diseases. It also has a special emphasis on prevention and research. There are two fellows of the first year level. The Fellowship is a combined effort between the UPR University Hospital in Carolina, the University Hospital at the Medical Center, and the VA Caribbean Healthcare System. 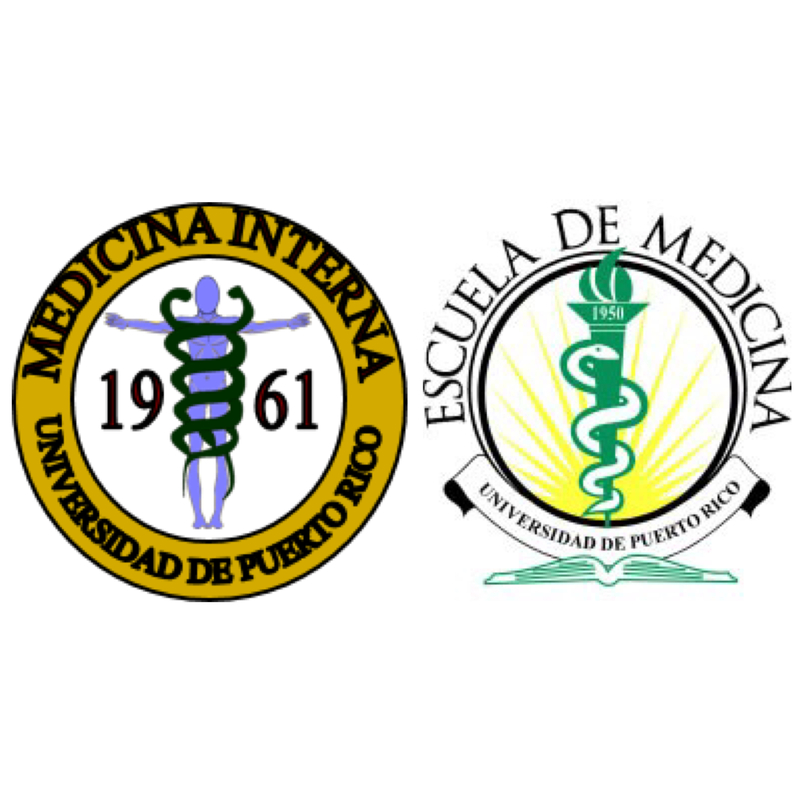 All fellows receive the rank of Instructors in Medicine at the UPR School of Medicine for the duration of their training. They are assigned to participate in the third year medical student’s course, as preceptors for case discussions and lectures. These activities allow them to further develop their teaching skills, maintain knowledge in Internal Medicine and to comply with ACGME requirements for residents. Alzheimer’s is the fifth leading cause of death in Puerto Rico with a prevalence estimated to be 46,000 patients . Description: Geriatric Medicine, a newly developed field of medicine, is the medical specialty dealing with the health problems of the aged. Approximately 13% of our population is over 65 years of age at present, and they are the most rapidly growing segment of the population. Internal Medicine residents should become adept in the clinical care of these elderly patients. Our third year Geriatrics rotation provides training and experience in the prevention, evaluation and management of multiple conditions that afflict the elderly patients and may affect their physical, emotional or psychological well-being. Competency in clinical geriatrics involves recognizing the difference in presentation of disease and the importance of maintaining functional independence in elderly patients. With increasing age, presentations of disease become less typical and are often muted, and timely recognition requires attentiveness to subtle signs. Appropriate management requires a balance of patient observation, judicious diagnostic intervention, and acceptance of limits as defined by the patient. Medical and psychological symptoms, acute and chronic, frequently exist. Effective management of problems may necessitate an interdisciplinary approach that takes social support into account. We have developed objectives for medical residents who rotate through the Geriatrics Unit at the Carolina University Hospital during their third year of residency. These objectives will be achieved by direct patient care, bedside teaching (with formal working and teaching rounds), Geriatric Seminars and Journal Clubs. At the end of the rotation, we assess the learning achieved. Geriatrics Unit: The Geriatrics Acute Inpatient Unit was established in June 1991 to develop models of care for the elderly and to provide education in problems of aging and the aged. It has been sponsored by the University of Puerto Rico, School of Medicine, the Department of Medicine and the UPR Hospital at Carolina. It functions independently but is closely related to the Department of Medicine. Norms: All Internal Medicine PGY-3’s have a 4-week rotation at the Geriatric Unit. It comprises direct patient care, including admissions, daily rounds and consultations. All senior residents are scheduled to present and discuss a Geriatrics seminar at the end of their rotation, and to discuss articles during the Journal Club sessions. The clinical rotation is Monday to Friday, from 8:00 AM to 4:00 PM. Residents and fellows share responsibilities for patient rounds on weekends and holidays. Procedures: Patients are admitted to the Geriatric Unit from the Emergency Room by Internal Medicine Attending physicians or directly from the Geriatrics Ambulatory Clinic. They may also be transferred from Internal Medicine or other departments. After discharge, all patients receive an appointment for a follow up visit at the Internal Medicine Continuity Clinic. Patients that have been followed by an Internal Medicine physician are transferred to their primary physicians, when all possible problems are managed and/or resolved. All patients admitted to the Geriatric Unit, as well as the clinic patients receive a Comprehensive Geriatric Assessment which includes a Mental Examination (Folstein), Depression Questionnaire (Yesavage), Nutritional Assessment and the Scales for Activities of Daily Living (Katz). They may be referred to the many services available at our institution including Dental Clinics, Ophthalmology, ENT, Urology, Dermatology, Orthopedics, or Internal Medicine Subspecialties. For services or special duties not offered at UPR Hospital at Carolina, they are referred to the Puerto Rico Medical Center.